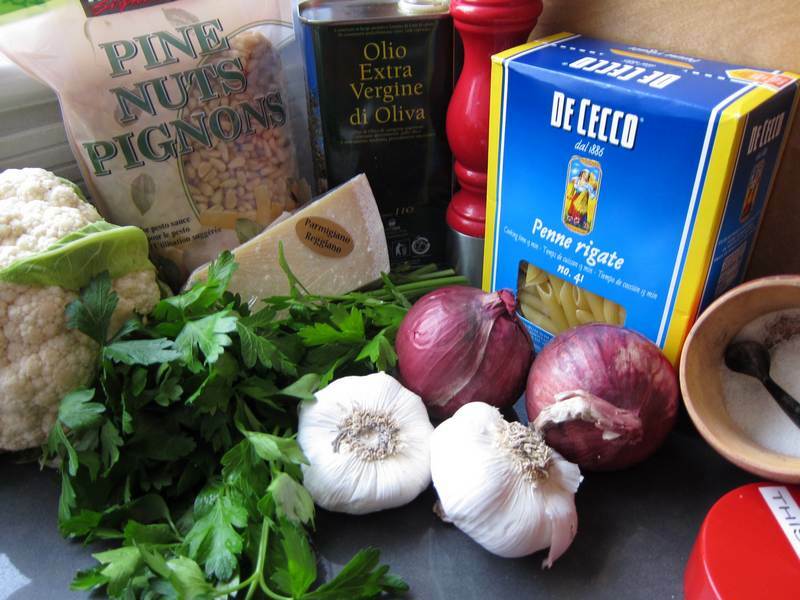 Is there any recipe that isn’t enhanced with the wonderful flavours of garlic and onion? I think not. The pesto in this recipe is so tasty on its own that it is tempting to keep repeatedly taste testing with the excuse of needing to adjust the seasoning. Notice the paucity of ingredients in the picture below. Less ingredients equals less effort, right? But, in this case, not less flavour. Preheat oven to 400F. Roast cauliflower, garlic, onion and cherry tomatoes (if using) with a little olive oil, sea salt and freshly ground pepper, for about 25 minutes until softened and browned. Poke with a small knife, removing vegetables that are done, keeping garlic in longer if required. 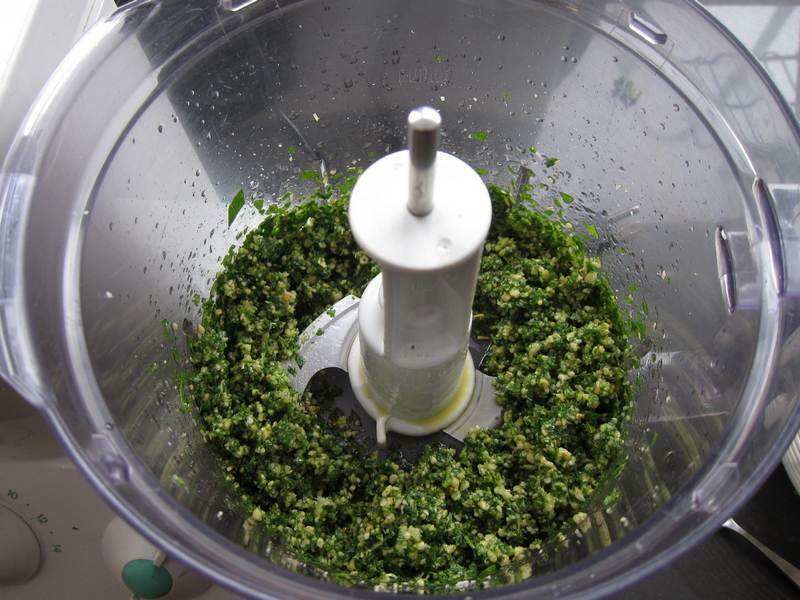 Use a food processor to chop garlic, dropping through feed tube while running, then add parsley pine nuts and grated Parmigiano. Add the oil slowly, in stages, through the feed tube. If you don’t have a food processor, use a mortar and pestle. Season with salt and pepper to taste. Keep the pesto covered until needed to maintain colour. Cook pasta according to directions. 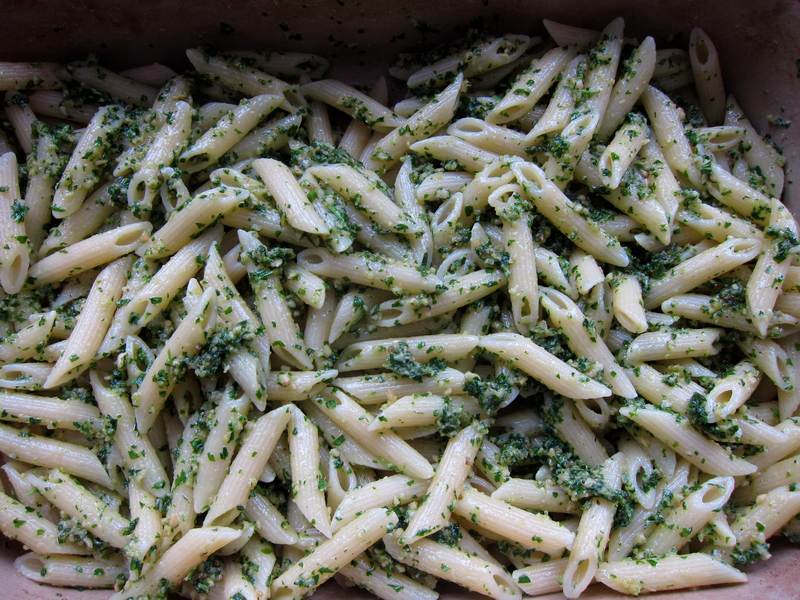 Reserve a little pasta cooking water just in case you need it to thin and spread the pesto. If you prefer to omit the pasta, simply add the pesto to the roasted vegetables. You could also use a cooked grain or bean instead of the pasta. 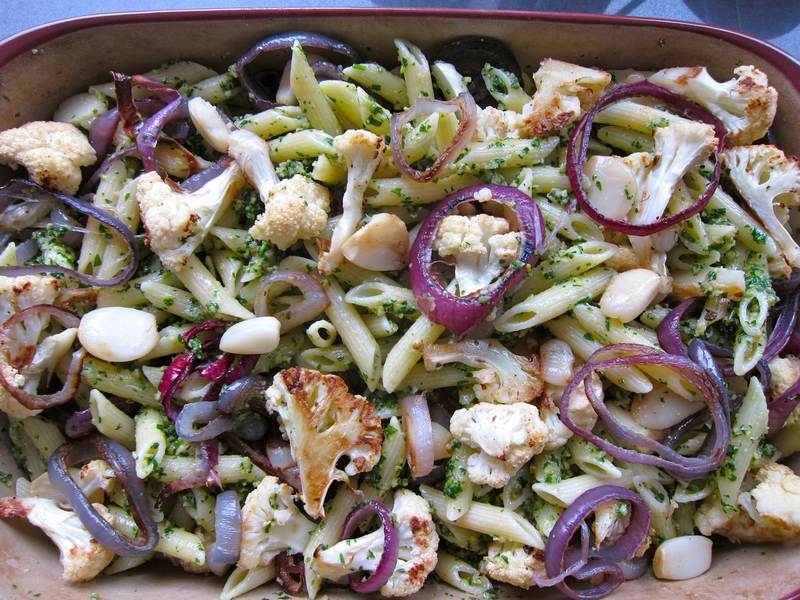 Mix pesto into pasta, add cauliflower, onions and whole roasted garlic cloves. Toss and garnish with grated Parmigiano if needed. Good hot or cold. You can add cherry tomatoes or slivered black olives for colour and bursts of added flavour. 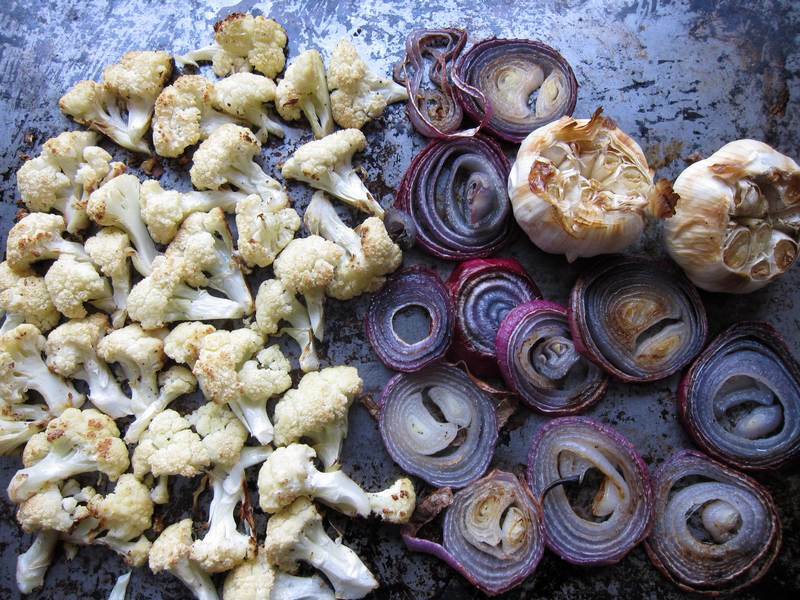 If you are looking for a good reason to eat cauliflower, which I find delicious when prepared right, read Harriet Sugar Miller‘s post on Eat and Beat Cancer or her take on a Mediterranean Cauliflower recipe. Source of parsley pesto recipes: Country Living, Fine Cooking, Food and Wine and, best for last if you are fresh out of lemon, Hunter Angler Gardner Cook. Shavasana “an ideal time to develop your ability to feel your energies” turns out to be my ideal time to dream up recipes. Thank you, yoga! Every time I meet someone who says they read all the Jittery Cook posts and look forward to them, I feel that all the effort is well worthwhile. Thank you to all my loyal Jittery Cook followers! H, I believe Harriet has the exclusive world rights to cauliflower. Holly: Thank goodness for Fridays. That is when Allan and I go off Jenny Craig and that is when we have a REAL MEAL by the way of Jittery Cook. Your recipes are all so delicious. What a vibrant dish for summer! Loving all the colors and the flavor’s should be fantastic – cannot wait to try this out – Thanks so much for sharing.